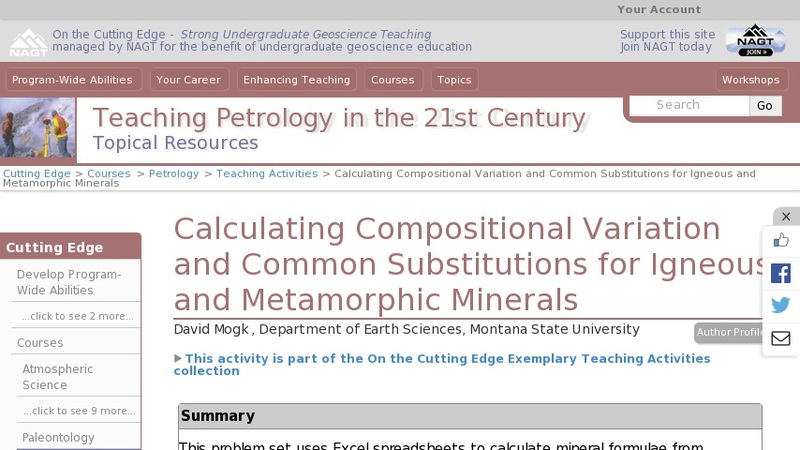 This exercise uses a number of Excel spreadsheets to calculate mineral formulae from compositional (microprobe) data. Numerous computational models are presented for most mineral groups (e.g. amphiboles, pyroxenes, micas), and students must critically evaluate which of these models is most applicable. Stoichiometry and charge balance are used to determine ferric/ferrous ratios--which is important for further applications such as geothermobarometry. Students are also asked directed questions about: compositional variation of the rock-forming mineral groups; representative complete, limited, and coupled solid solutions; site occupancy of major elements, as determined by the various computational models used; graphical representation of the calculated mineral formulae; and the composition and significance of certain varieties of these rock-forming minerals are addressed.